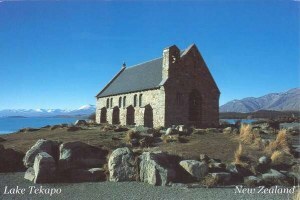 Situated on the shores of Lake Tekapo is the Church of the Good Shepherd, which, in 1935, was the first church built in the Mackenzie Basin. The church at Burkes Pass, St Patrick's built in 1872 was the first church built by pioneers as a joint community effort, by Anglicans Presbyterian and Catholic settlers. Also a joint venture between Presbyterians and Anglicans, St Columba in Fairlie was built in 1879.